What an awesome weekend! We finally got some snow on Friday night into Saturday morning. It was only a few inches, but enough to get the sled out. 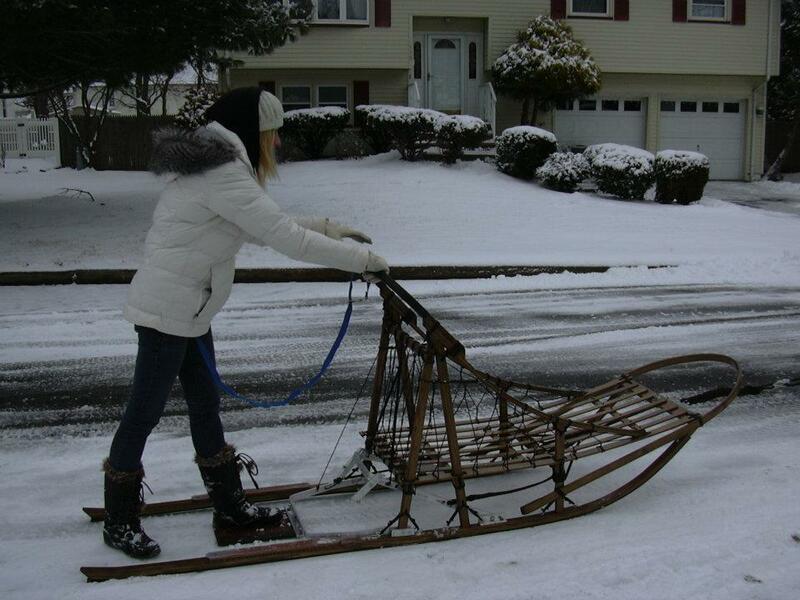 I put the dogs out on the picket line and got the sled ready for its first voyage. The plan was to just take it up and down our dead-end street, since the snow was nicely packed on it. Of course, as I was hooking everything up, the plow came through and scraped the street. I swear, I’ve never seen a plow do its job so well. After the plow finished, the street wasn’t in the best shape for sledding. There was a bit of exposed pavement, ice, and some areas of compacted snow. But we had come too far to give up now! 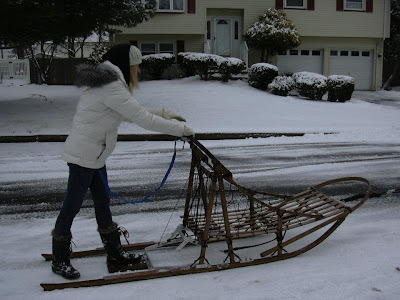 I had originally planned on walking the sled up and down the street, so that the dogs could get used to pulling something lower than the bike. I had also planned to hook Knox up, since it was only going to be at a walking pace (I just got my new 4-dog gangline and I’m eager to try it out). That plan went out the window, once the street became ultra slick. I dropped Knox and had him walking on a leash (held by a friend), kept Denali in lead, and left Dexter behind her in wheel. Not the set-up they’re used to, but the run wasn’t too bad. We went down my street and down some side roads… nothing crazy, probably less than a quarter mile total. On Saturday evening, we decided to give it another go. It began to flurry some more, so the road was looking a little more accommodating. I hooked Dex and Nali up with their usual 2-dog leader section and they managed a lot better. We ran as far as we could, unhooked the dogs, and carried the sled over the areas without snow cover (parking lots, mostly). Luckily, I had plenty of “handlers” there to help. We made it to my little wooded area and really got to test the sled out. It was getting dark and pretty cold, so the dogs were on fire. I took them around our usual loop and they looked amazing. Well, as far as I could tell – towards the end of the loop, we were going so fast, I could barely keep my eyes open against the flurries. Definitely gotta bring my goggles! After my run, I let my friends try it out and I’m pretty sure they all loved it. Sunday morning, AJ and I went out again with Dex and Nali. With temperatures expected the reach the upper forties/lower fifties this week, I figured it may be my last opportunity to mush on snow. It was already a bit warmer, so the dogs weren’t as amped as they were the night before. Still, we got in some good runs and had quiet, sleepy dogs for the rest of the day. I’m estimating we ran a little over five miles between all our runs this weekend. I didn’t bother tracking with my phone, since my friends were taking turns on the runners, and this wasn’t serious training. I needed the practice more than the dogs!